Was Jesus Ignorant About His Second Coming Date? Was Jesus Ignorant? It is argued that Jesus as God Incarnate sometimes only operated out of limited human knowledge.! ¶ "But concerning that day and hour no one knows, not even the angels of heaven, nor the Son, but the Father only." This clause is not found either in Matthew or Luke; and Ambrose says it was wanting in some Greek copies in his time. To me it is utterly unaccountable, how Jesus, who knew so correctly all the particulars which he here lays down, and which were to a jot and tittle verified by the event-how he who knew that not one stone should be left on another, should be ignorant of the day and hour when this should be done, though Daniel, Dan. ix. 24, &c., could fix the very year, not less than five hundred years before it happened: how he in whom the fullness of the Godhead dwelt bodily, and all the treasures of wisdom and knowledge, should not know this small matter, I cannot comprehend, but on this ground, that the Deity which dwelt in the man Christ Jesus might, at one time, communicate less of the knowledge of futurity to him than at another. However, I strongly suspect that the clause was not originally in this Gospel. Its not being found in the parallel places in the other evangelists is, in my opinion, a strong presumption against it. B.C. < JESUS CHRIST > A.D.
Luke 22:19 And he took bread, and when he had given thanks, he broke it and gave it to them, saying, "This is my body, which is given for you. Do this in remembrance of me." As we prepare to celebrate this Christmas, we remember the Christmas Child who 'divided' time. We describe time as either being "B.C." (Before Christ) or "A.D." (Anno Domini). No other person in history has ever been similarly honoured. When Christ came, everything changed - including the way we refer to history. When Christ comes into a life today, everything changes still. It's not just History that has a B.C. and an A.D. point - it's every life who has turned to the only One who can divide the history of their lives into B.C. ("before I came to Christ") and A.D. ("After my Decision to follow Christ"). This Christmas is a celebration of the One who entered history and erases pasts. He did this for me. Before Christ found me I had done shameful things. When I came to Christ He erased my past, my "B.C. ", and for that I will be eternally grateful! Since I have placed my life under the Lordship of Christ my future, my "A.D.", is now secured. There are times when my previous life of sin haunts me relentlessly. How could a Saviour who atoned for sins nearly two thousand years ago possibly forgive my sin which, at the time, I hadn't committed yet? But this Saviour is not just Anno Domini (Lord of the Year) He is Aetas Domini (Lord of Time). Jesus Christ literally has time. There are some people who say that Jesus can only guess what the future holds - but that He may guess wrong. The technical term for this isOpen Theology. There are others who say that Jesus knows exactly what choices every personcould make and has chosen the pathway of collective choices that produces the best outcome. The technical term for this is Middle Knowledge. But the mystery saturating the pages of Scripture is that the Once-Christmas-Child is not merely a Guesser of the Future, but the Lord of the Future. But not just the Future, time. He is Aetas Domini! The first Christmas was what all the past looked forward to. The first Christmas is what all today, and in the future will, look back to. It changed everything. It still does. When I shared this message last Sunday, a lady who had had many years living under Narcis Domini came to Christ and wanted the Aetas Domini to be her Domini. She wanted her life to move from B.C. to A.D.! Ephesians 2:1-4aAnd you were dead in the trespasses and sins in which you once walked, following the course of this world, following the prince of the power of the air, the spirit that is now at work in the sons of disobedience— among whom we all once lived in the passions of our flesh, carrying out the desires of the body and the mind, and were by nature children of wrath, like the rest of mankind. "I want my past to be B.C." she said. Her eyes said it all.Before Christ. Before Christ we were "dead in the trespasses and sins in which we once walked" wrote the seasoned Apostle. But then Christmas! And "all things have become new" (2Cor. 5:17). Does you life have a time-dividing point? Can you identify that era of your life which might be referred to as "B.C."? Everyone who lives in the Anno Domini (Year of the Lord) has a B.C. The next time you are dogged by your past failures, mistakes, sins and trespasses, you have a Saviour who has erased these from your past. The next time you are anxious, you have a Saviour who is with you now! The next time your future looks uncertain you can walk into it with the One who is Lord of it! Faced with a Throne he never wanted, a war he was ill-equipped for, and nation in collective anxiety about its future, King George went on radio and gave a stirring speech to the people of the British Empire on September 3rd, 1939 and then followed it up with a Christmas Day speech. How this reluctant King, who suffered with serious speech impediments and a dire lack of self-confidence, came to give this speech was the subject of the movie: The King's Speech. [Dec. 25th 1939] "I said to the man who stood at the Gate of the Year, 'Give me a light that I may tread safely into the unknown.' And he replied, 'Go out into the darkness, and put your hand into the Hand of God. That shall be better than light, and safer than a known way.'" Jesus has time. He has time to deal with our pasts. He has time to help us in our nows. He already knows our tomorrow, and has already ensured that no temptation/adversity will come our way that could overpower us! Yes, the Christ of Christmas has not just established Anno Domini, but has settled the matter of Who Rules Time. The first Christmas laid the foundation for Christ to be acknowledged as Aetas Domini. Father, thank You for sending the Christmas Child as our Saviour. Thank You that our past is dealt with and our future is secure. As we look back, we give thanks. As we look forward, we worship. Help us, we pray to acknowledge that Jesus is merely the Author of Anno Domini, but He is truly Aetas Domini - Lord of All Time. Amen. FIND IT DIFFICULT TO HONOUR? Gen. 37:3 Now Israel loved Joseph more than any other of his sons, because he was the son of his old age. And he made him a robe of many colors. How did Joseph's brothers feel when their father honoured him above them? We call it jealousy. But it was actually envy. Joseph's brothers felt it. Jesus told parables involving honour. For example, there was the parable about those who had been working the full day and expected to get paid more than those who had only worked an hour. Jesus shocked His audience by describing the honouring of those who had only worked an hour above those who had worked all day! The Apostle Paul confronted people's poor reaction to others being honoured when he wrote to the Romans and told them the remedy for envy: outdo one another in showing honour. In another parable of Christ, He told of servants who had been working a long day, and came into their Master's house expecting to relax (and maybe even get a little thanks). Instead, they were called upon to continue serving and honour their master. Rather than thinking they are being hard done by, the Lord Jesus said that they should be glad that another is being honoured and consider that they are merely lowly servants who live to honour others with their service (Luke 17:10). Many of these teachings abouthonour were given before a crowd of Pharisees who loved to be honoured - and hated it when others were. We will at times ache because we are not recognised or acknowledged. How many mothers feel taken-for-granted? How many employees feel unappreciated? How many people on a church roster feel overlooked? It's nice to be honoured, but unfortunately it happens all too rarely. Joseph's brothers could not tolerate that their father Jacob would so overtly honour Joseph over them. As a pastor, I've seen this emotion stirred many times when I've publicly honoured someone. "You thanked them from the pulpit! But I deserve thanks to! Why didn't you thank me?!" After this sort of thing happened far too many times, I realised that honouring someone actually tests others. Honouring someone flushes out what is in another's heart. It reveals why they are doing what they are doing. Afterall, in serving Christ we should be serving to glorify Jesus and promote His Cause - regardless of who gets recognised for it. Right? The God we worship is a God of infinite love. Because He loves someone, does not mean that I get less of His love. Since honour is an aspect of love, when soneone is honoured, it actually does not mean that I am deprived of anything. You receive what you give away. It's almost counter-intuitive. The Bible repeatedly refers to "sowing and reaping" - that is, what you sow (give away) is what you will reap. If I want recognition and honour for what I do, I need to recognise and honour others. Honouring others is good for me. It takes humility to honour another. To clap, support, present, another helps me to develop my humilty. According to James 4, it's only when I am humble that I qualify for more of God's grace. Honouring helps me to fulfil the Great Commandment. Honouring, giving someone someone a clap / a cheer / a gift / a public recognition / a card of appreciation / a public tribute - is showing love. To love others is the Great Commandment of Christ and is repeated in John's epistles as the hallmark for mature Christianity. "The real power of effective leadership is maximising other people's potential, which inevitably demands also ensuring they get the credit. When our ego won't let us build another person up, everything has to build us up, then...we have stopped leading..."
When I honour a leader I look for a couple things: their response, and the response of the other leaders around them. How a person receives honour says a lot about them. How a person reacts when another is being honoured, says a lot about them. Notice how Jesus regarded honour? John 5:23 that all may honor the Son, just as they honor the Father. Whoever does not honor the Son does not honor the Father who sent him. Wow! The God of the Universe is secure enough to honour, celebrate, recognise, thank, reward, His Servants! Man may not see, but God always does. The next time you're not being honoured, don't pout (like I do) insteadrejoice with those rejoice (Romans 12:15), and join in seeking to fulfil Romans 12:10 ("outdo one another in showing honour"). Then one day, in fact, the day, our Father in Heaven will become the source of your previously unimagined honour. I wonder how the account of Joseph and his brothers would have been different if they had honoured they colour-coated sibling instead of envying and despising him? Father, help us to honour one another. Lord, we live in a world where it is all-too-easy to tear others down and ridicule - rather than to promote others and honour them. Oh God, I pray that we can honour our spouses, our children, our parents, our leaders, our family, our friends, our team-mates. Help us at Legana to create a therepeutic culture where honour abounds and envy and pouting is rare. May we draw our security, affirmation, and identity from You and what You've revealed to us in Your Word, in Jesus' Name, Amen. Most Australians have seen Frederick McCubbin's 1904 painting, The Pioneers. Even though I have seen this painting thousands of times, it wasn't until today that I actually saw it. And I was deeply moved. If I was a proud man (and unfortunately I am, so this upcoming confession is very difficult for me) I would claim that this fresh vision of this iconic Australian painting was due to my cultured eye for detail. But alas, I can make no such claim. This painting was interpreted for me by someone who wrote about it just two years after it was painted. This cultured art connoisseur was the man whom my daughter asked this after afternoon as she looked at an original photo of him in my office, "Was F.W. Boreham born old?" McCubbin's painting is in three sections. The first section has a young wife pining for her former life. Perhaps, and probably, this was England. 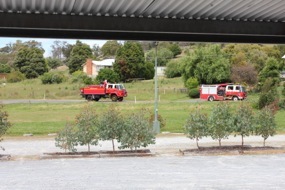 In the background, her husband is seen near their covered wagon lighting a fire at the base of a blue-gum tree. This iconic young woman is emblematic of the sacrifice that thousands of such women made in pioneering Australia. Pioneering is tough, lonely, and taxing. Many of these early female pioneers experienced madness in this face of this. McCubbin captures this with this opening scene. The second scene has the husband resting on a log. Axe nearby. His young wife is now a mother as the wistful baby's arm is flopped over the should of its mother reveals. In the background of this scene is not their wagon, but their cabin. These pioneers were making progress! But still there must have been a high price to pay. These pioneers were sacrificing for sake of future generations. But there is a cost that is more painful than self-sacrificing. Consider Abraham, says F.W. Boreham, who would have gladly taken the place of his beloved son Isaac as they ventured up the mount of sacrifice. Consider the cost that Jephthah paid as he bid his daughter farewell (Judges 11). Sacrifice costs dearly. In the third scene, we see through the cleared bush, in the far distance, an emerging town. But in the foreground we see the husband kneeling at the foot of her grave. It is a poignant scene. It catches a pain that is greater than that of self-sacrificing. The pain of being the cause of someone else's sacrifice! Abraham nearly felt it. Jephthah did. God the Father did. "The pioneer ! It is by such sacrifices that these broad Australian lands of ours have been consecrated. Oh, the brave, brave women of our Australian bush ! We have heard, even in Tasmania, of their losing their reason through sheer loneliness ; and too often they have sunk into their graves with only a man to act as nurse and doctor and minister and grave-digger all in one. F.W. Boreham points out to his readers that this iconic Australian painting was actually a picture of the Gospel! In the same way that the Father's sacrifice was equal to, if not greater, than any sacrifice ever made. Boreham saw in this famous Australian painting the message of the Gospel. A message of not mere self-sacrifice for the benefit of others, but a sacrifice that goes beyond personal cost. 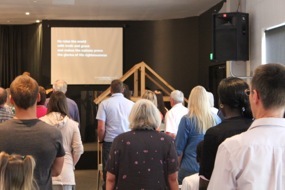 Boreham saw this as typical of God's sending His Son to die for us. This was the genius of F.W.Boreham. He looked at everyday, ordinary things, and well-known pieces of art, and interpreted them for his audience in a way that could see what they previously did not see - but was there all along. He had a way of seeing the Gospel in trees, paint, art, literature, theatre and history. During the upcoming movie release frenzy season, consider what Boreham did and look for the Gospel in these stories. You'll probably see it once you start looking for it. This is because, as Winkie Pratney points out, the Gospel is THE story from which all other stories take their cue. When you see feint traces of THE story in the books, movies, art or nature, help others to see it as well. That, don't just be a consumer of culture, be an interpreter of it. Of course Boreham was not the first to master this. The great cross-cultural missionary from Tarsus did the same thing when he entered Athens when he interpreted a monument and a 'pagan' poem for his culturally-aware audience. In a Biblically illiterate culture, we may find that we need to do this more and more. Father, help us to see the Gospel. Help us to see the Gospel story of You as Creator, Rescuer, Redeemer, Resurrector, and Righteous Judge, in art/literature/nature. May we have the grace and wisdom to share this interpretation of our culture with those we know and care for, in Jesus' Name, Amen. Follow Jesus and if your serious about staying close, you'll soon be constantly surprised! Just when we thought God was created in our image, He does something, says something, deals with something - in ways completely other. The problem with following Jesus closely is that it gets uncomfortable! He wants me to respond to people in surprising ways. Just when I want to hit someone - He leads me to follow Him into blessingthem with a surprise gift! Just when I want to be alone and rest - He leads me to follow Him to a lonely, weary, faith-battler and surprise them with encouragement and time. Surprisingly I feel invigorated every time I follow this Surprising Saviour. It's when I follow from a distance that I experience distance with my Saviour (just like the Apostle Peter did). Just when I thought following Jesus was a walk along a tropical beach (I learned this from the famous "Footprints In The Sands" photo) - I'm surprised to discover that I must follow Him at times over jagged rocks. I can tell I'm following Him because I have to place my feet in the blood-stained footprints of my Surprising Saviour as we walk along the path of trial. Then I'm surprised when He wanders up the slopes of self-discipline and I have to choose each step I make - even though I usually don't want to. It seems like every second step up the slopes of self-discipline is lands me on a temptation. These steps flood my mind with very appealing invitations. "You're tired, skip your devotional reading tonight...you can read it tomorrow." "You haven't got time to pray now, there's people waiting to see you...just pray when you get an uninterrupted minute." "Don't force your faith or beliefs on this non-Christian...you'll be offensive." And so on. As I struggle up these slopes of self-discipline I am frustrated by those who seem to outpace me. But then I surprised to realise that it's not those who have been following the Saviour longest who travel up with the most ease - it's those who follow closest. Have you been surprised by the Saviour? His original disciples were. Herod was. Pilate was. James was. He is a surprising Saviour who can lead us in surprising ways, bring surprising people into our lives, and call us to surprise people with acts of undeserved kindness. Father, we want to follow Your Saviour-Son. We want to be surprising to a world used to giving as good as it gets. Help us to follow this Surprising Saviour closer, in Jesus' Name, Amen. "I DIDN'T THINK CHRISTIANS DID THAT!" I recently heard of this type of complaint from a pre-Christian about a group of Christians. For the moment, I don't want to mention what this group of believers had done, but it is certainly a common complaint. Of course, the complaint can sometimes be justified: Christians do sometimes behave badly and the world knows it! When Christians behave badly they bring shame to the Cause and Body of Christ. To have this highlighted by the world is a negative moment. But even this moment can be turned around into a positive opportunity. The next time you hear this type of complaint (either about yourself or someone else) here's a very simple and elegant question to respond with: "When you say 'Christian', what do you mean? That is, what is a Christian?". Listen closely to their answer. It will probably be answer that spells Christianity - D O. That is, instead of defining a Christian they'll probably describe Christian behaviour instead. Thus, this presents an ideal opportunity to winsomely correct this misapprehension about what a Christian is. Using a paper-napkin you could write the word "D O" on the serviette to sum up what they said to define a Christian. You could then ask them if it would be OK to give them the definition that the Bible used? If they consented, you could then add " N E " to form the word: " D O N E ". This week I had a troubled soul come and see me. 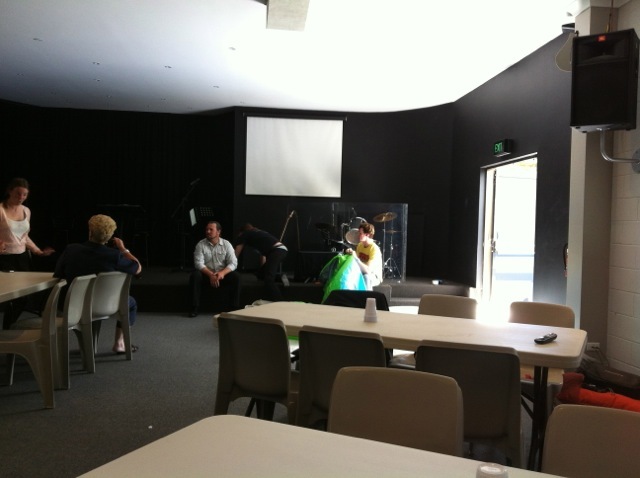 We conversed then I asked the question I've just championed:What is a Christian? In summary their answer was a " D O " answer. After sharing with them about the grace of God through Jesus, and explaining that the only One invited into God's Presence is Jesus and that unless you are "in Christ" you can not go to Heaven or be reconciled to God for eternity, I asked them if they would like to become a Christian. They said, with tears flowing, "Yes I would." We prayed together and the work of the Spirit in this person's life starts a fresh new chapter. But what was the cause of the original complaint about inappropriate Christian behaviour? A group of Christians had told someone that sexual immorality was a sin. For this "intolerance" they were accused of acting "unchristianly". It would have been very easy to argue the point that Christians are not meant to be tolerate of everything. But this would have been a distraction from turning this negative moment into a positive opportunity. First Peter 3:15 "but in your hearts honor Christ the Lord as holy, always being prepared to make a defense to anyone who asks you for a reason for the hope that is in you; yet do it with gentleness and respect,"
Of course, there will be times when the world highlights actual bad behaviour by Christians. If that Christian is you, then perhaps the best response is to apologise to the complainer for misrepresenting Christ, and then apologise to your Lord. But this too can be turned into a positive opportunity for promoting Christ's gracious offer of reconciliation with God the Father. Father, give us Your heart for people. Help us to walk blamelessly before You and the World. May we have soft, compassionate, hearts toward others and feel the responsibility we have to be good ambassadors for You, in Jesus' Name, Amen. You can now order some of UNDERSTANDING THE BOOK OF REVELATION Resources online. Complete these transactions securely with Paypal. After confirmation of your secure payment an email will be sent to you with download instructions for your eBook. These eBooks are great value. Once downloaded they can be printed or transferred to an eBook reader or PDA for portable reading. 1. Select your eBook from the list below 2. Select the preview to read the first chapter. If it looks interesting, perhaps check out the feedback supplied by other readers. 3. Click on the "Add to cart" button. This will take you to a secure Paypal site where you can pay for the eBook with a credit card, or if you already have a Paypal account with credit in it you can draw down on that account to pay for it. 4. Once payment is confirmed you will receive a Thank You message, then you will automatically receive an email with your download instructions. Copy and paste these login details into the download page where you will be directed. 5. After entering your download registration information, the download of your "zipped" eBook will commence automatically. 6. Once the zipped file is downloaded to your computer, you will need to "extract" it to your computer using a program like "Winzip" which is generally built into Windows. Apple Mac users will use "Stuffit" to unzip or extract the eBook. 7. After the eBook is extracted / unzipped you will need Adobe Acrobat Reader to view the contents. This software is available for free from the Adobe website. 8. Once the eBook is open you might like to print it off and place it in a ringed binder or similar. Or, you could transfer it to your PDA to carry with you. 9. You should then email the author with positive or contructive comments about the eBook so that it can be refined even further or your comments incorporated into the promotion of the eBook. 10. Finally, email everyone in your address book who you think would be blessed by your recommending that they too read this eBook by downloading their own copy. 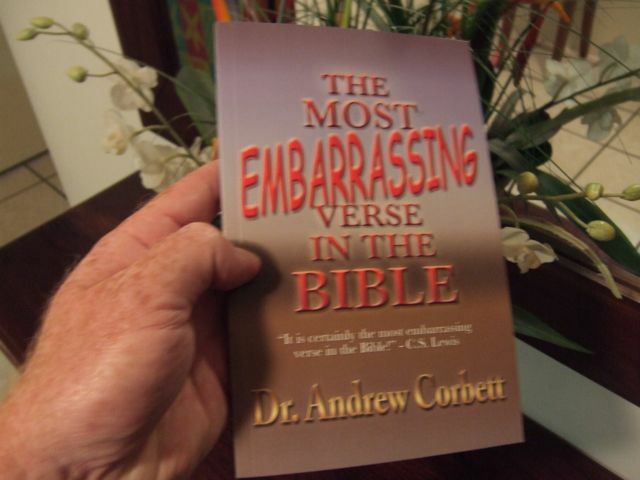 THE MOST EMBARRASSING BOOK IN THE BIBLE! The entire book of Revelation explained! Many people have accepted the recent idea that most of Revelation is yet to be fulfilled! and according to Matthew 24:34- had to be! Set yourself free from the fear of tommorrow and read this ground-breaking commentary! This eBook discusses what CS Lewis described as "the most embarrassing verse in the Bible"
man who was simply (and incorrectly) guessing about the future. citations are given throughout this commentary on what is generally called "The Olivet Discourse". such as Prof. Bertrand Russell and Prof.
Gospels as "the most embarrassing verse in the Bible". understand the Bible, the identity of Jesus Christ, and what the future might hold. The Book of Revelation is the most mysterious book of the Bible. It claims to predict the future. But because its language is highly symbolic many readers have failed to understand what it is really saying. This has led some preachers to make wild guesses and speculate about what it really means. Often this guess work and speculation has been horribly wrong and this has led people to dismiss the Book of Revelation as too difficult - perhaps even impossible - to understand. But this is not the claim of the Book itself in the opening paragraph! 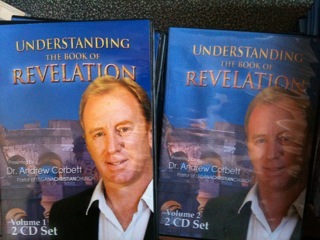 In these two DVDs, Dr Andrew Corbett, author of popular - The Most Embarrassing Book In The Bible - looks at why people have got the interpretation of the Book or Revelation so wrong, and how we can better understand what it is trying to show us. In the first DVD, Dr Corbett sketches some of the more recent history of speculation about the interpretation of the Book of Revelation. This contains video clips of various "Bible Prophecy Teachers" who have speculated about how the Book of Revelation has foretold events in our day and predicts our immediate future. The viewer will soon realise that this type of speculation, despite its popularity, is most unhelpful when it comes to really understanding what the Bible is all about. On the second DVD you will see the entire session, part 4, of a seminar Dr Corbett holds regarding the Book of Revelation. This DVD gives an overview of why so many people have misunderstood and then misapplied the message of the Book of Revelation. It will show you that the sound principles for interpreting any Book of the Bible also, if not especially, apply to the Book of Revelation. By applying the rules of hermeneutics (Bible Interpretation), we can better understand what The Book of Revelation meant to its original audience and therefore better understand how it applies to us today. 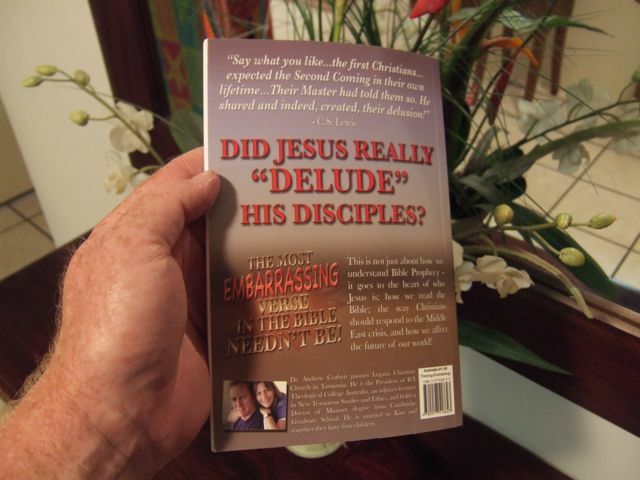 However you choose to use to use this DVD, whether it is to build a DVD teaching series, or to enjoy it for personal enrichment, or to give it as an encouragement to someone, or watch it in your Bible Study group, this DVD will help you to ponder the wonders of God's Word and have a deeper appreciation for the Christ. 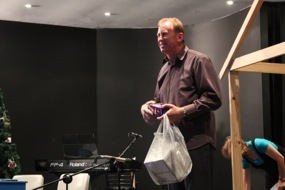 Dr Andrew Corbett is the President of Finding Truth Matters, ICI College Australia, and pastor of Legana Christian Church. He is the author of The Most Embarrassing Verse In The Bible. We accept: Mastercard, Visa or Paypal. Postage anyway in Australia is $AU4.50 ($AU7.50 worldwide). 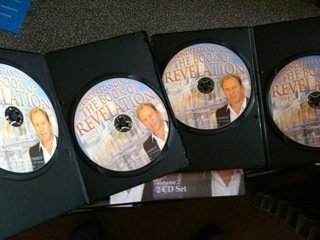 This DVD is produced by LEGANAMEDIA a Not-For-Profit media ministry. We ship worldwide. Regarded as one of the leading exponents of the Book of Revelation, Dr Andrew Corbett in this 4 Part series on the Book of Revelation (presented as a seminar) is now available as a 4 Audio CD set. Order this 4 Disc Audio CD for just $20 plus $9.95 shipping anywhere in the world). "Be filled with the Spirit" the great apostle wrote. "Wait until you receive the Holy Spirit" said Christ. An apostle and the Messiah. Both great exponents of truth taught that the Christian life is empowered by mere knowledge. Neither is it empowered by religious effort. No, it is initiated, activated, and empowered by the Holy Spirit. Becoming a Christian is not like joining a religious club. It is an utter transformation of the heart. This radical transformation is not achieved by wishful thinking, New Year resolutions, or religious devotion. It is initialised when the Holy Spirit opens a person's spiritual eyes and ears. When this happens, a person sees their true spiritual condition before God and realises their dire situation due to their bankruptcy of soul. They will then find that their previously deaf spiritual ears begin to hear the soft, gentle, voice of God calling them to come and follow. Jesus said that when the Holy Spirit initialises, He would convict of sin, reveal the righteousness of God, and convince of the Judgment to come (John 16:8). John 3:8 "The wind blows where it wishes, and you hear its sound, but you do not know where it comes from or where it goes. So it is with everyone who is born of the Spirit." When a person responds to God's invitation to have their sins forgiven, their guilt expelled, their past redeemed, their future secured, and their destiny glory-bound, the Holy Spirit activates a new birth of their dead spirit. Without the Holy Spirit taking the benefits of the finished work of Christ and activating this salvation in a person's soul, mankind would be left to mere futile guess-work (generally called: religion). After the Holy Spirit has activated new spiritual life within a new worshiper, He leads His new host to the river of empowerment and invites them to bathe. 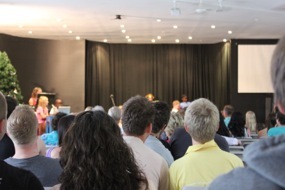 This Baptism in the Holy Spirit empowers the new worshiper to confidently share their newfound life. One of the surest signs that a person has been baptised with the Holy Spirit is their desire to share the Good News with others. The Holy Spirit within them compels them to reach out to those crippled by their burden of guilt and sin. Other evidences of the empowerment of the Holy Spirit, known as the Baptism with the Holy Spirit, is the activation of spiritual gifts beyond the activation gift of salvation. In Mark 16, Jesus announced that these gifts included speaking in tongues, casting out demons, and healing the sick. Mere religion or positive thinking can not compete with this offer. If you sense your soul being initialised, then receive the grace of God to have your soul activated by the Holy Spirit. If you have had your soul activated, then begin to seek the empowerment of the Holy Spirit. 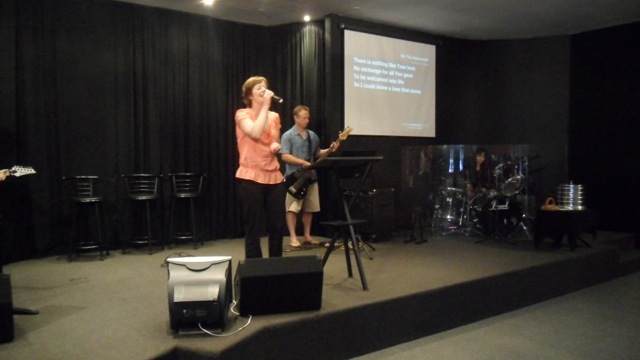 This is most commonly done within the community of the Redeemed as they worship together. In an atmosphere of praise, an activated soul can seek the Baptism with the Spirit, pray and receive prayer, and have their tongue wonderfully redeemed with newness. Acts 10:44-46 ¶ While Peter was still saying these things, the Holy Spirit fell on all who heard the word. And the believers from among the circumcised who had come with Peter were amazed, because the gift of the Holy Spirit was poured out even on the Gentiles. For they were hearing them speaking in tongues and extolling God." 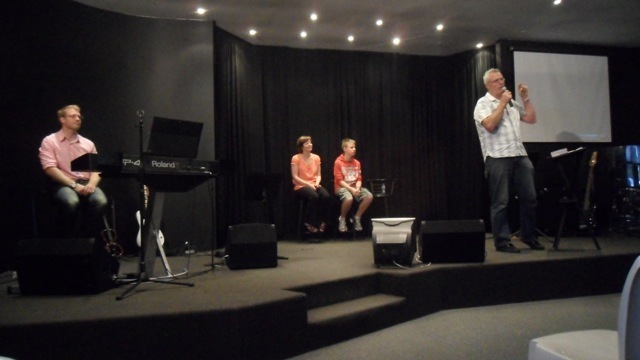 Pray that more people will be initialised by the Holy Spirit. Pray that more people will be activated by the Holy Spirit. Pray that those who are activated by the Holy Spirit will be empowered by the Holy Spirit.